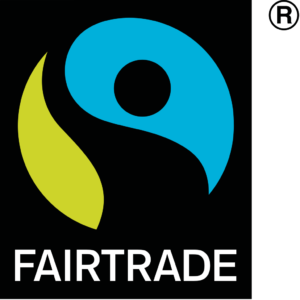 The Mark means that the Fairtrade ingredients in the product have been produced by small-scale farmer organisations or producer groups that meet Fairtrade social, economic and environmental standards. The standards include protection of workers’ rights and the environment, payment of the Fairtrade Minimum Price, and an additional Fairtrade Premium to invest in local business or community projects. For some products such as bananas, tea and flowers, Fairtrade also certifies plantations – companies that employ large numbers of workers on estates. Fairtrade Standards for such large-scale production units differ and protect workers’ basic rights; from keeping them safe and healthy, allowing them freedom of association and collective bargaining, to preventing discrimination and ensuring no bonded or illegal child labour. These standards also require employers to pay wages that progress towards living wage benchmarks, ensuring decent working conditions and strong worker rights is central to Fairtrade’s work. The farmers and workers themselves decide how the Fairtrade Premium should be invested. The premium is the additional sum of money paid on top of the Fairtrade minimum price that farmers and workers receive which can be invested in social, environmental and economic developmental projects to improve their businesses and their communities. In real terms, it means investment in schools, transport, health care, sanitation, an improved environment and better business equipment and practices. Fairtrade works with a range of stakeholders but our global system is 50% owned by producers representing farmer and worker cooperatives. With an equal voice, producers have a say in decision-making within our General Assembly and on Fairtrade International’s Board of Directors. Through the Board and its committees, they are involved in decisions on overall strategy, use of resources and setting prices, premiums and standards. For most Fairtrade goods there is a Fairtrade minimum price which is set to cover the cost of sustainable production for that product in that region. If the market price for that product is higher that our minimum price, then farmers and workers should receive the market price. Payment of the minimum price is regularly audited and checked by FLO-Cert. This acts as a vital safety net for farmers and workers and protects them from fluctuations in the market prices of the products they grow for a living. This protection ensures they can have an assured and stable income and plan for their future. Fairtrade is the only certification scheme that offers such a unique minimum price protection for farmers. Over and above the Fairtrade price, the Fairtrade Premium is an additional sum of money. which goes into a communal fund for workers and farmers to use – as they see fit – to improve their social, economic and environmental conditions. Farmers and workers themselves determine what is most important to them; whether this is education or healthcare for their children, improving their business, or building vital infrastructure such as roads and bridges for their local community.